Do you have points? but can't use them! iFLYflat helps you get the most value out of every point. Using points for Business Class will save you thousands of dollars/ticket compared to a normal fare - our passion is to help you fly better, for less. We’ve designed this service for clients who understanding that spending their time to search online or wait on hold with an airline is not the smartest use of their time and energy. The Points Flight Finder Concierge is just like it says, we find reward flights, and we are very good at it. Our team ensures you get the best seat for your points, saving you time and money, and the stress of booking complex reward seats. We employ the best practice to use your points efficiently and are the recognised industry experts. Our experienced Flights Concierge team will find and book your reward seats with 5 star service. Our service will keep looking across all options on all airlines to get you flying. No one else does this. We have a team of 12 people, with 8 dedicated to solving flight bookings. The aim of our team is to help you fly cheaper with your points rather than pay $8,000+, or waste your time hopelessly trying to find seats without success. We have developed proven processes and the experience of our dedicated team has redeemed 4,700+ seats with 375+ million points. Meaning we know exactly the best combinations of using different credit card points and frequent flyer points, to find and book the right seats. We would also be frank to admit, even with our resources, commitment and knowledge, sometimes the airline has no seats (approx 20% of the time), but you can rely on us to keep on trying all options to help you to fly in comfort. A $50 Deposit is payable by credit card when submitting this form, to certify genuine bookings receive our full attention. The full success-fee (details below) becomes due when we find the right flights for you, otherwise there is no other fee. Using points to find seats is getting harder, more complicated and more time consuming. Designed that way because airlines can only provide limited reward seats. If airlines released more reward seats and made it easier to book, they wouldn’t be able to charge $8,000+ for that business class ticket. 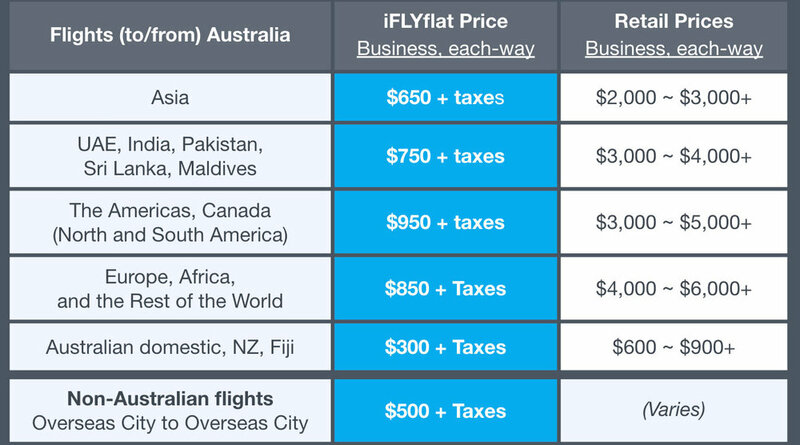 Learn how iFLYflat can benefit you, or your business. Prices quoted as one person, one-way plus applicable airline/airport fees & taxes. Changes and cancellation fees apply. Fee applies for Stopovers, Infant bookings. Prices for: First class is +$500 on top of the above business class fees. Premium Eco = $300 & taxes one-way/pp. Economy = $250 & taxes (one-way/pp). The approx price will be quoted at the start of every booking request before we begin. + When do seats come up? Reward seats changes constantly, our team searches daily and is ready to book as they become available. Unless you are always looking, you might miss your flight. + Can points be used to fly different airlines? Our team calculates all the best combinations of partners and alliances. Points from one airline can be used to book other airline partners and vice-versa. + Can you get me an upgrade? Unfortunately we can’t predict lottery numbers. Upgrades is like a game of luck, spare seats (if any) are allocated however the airline wants to do, slightly influenced by loyalty status and other rankings. The best seat is a confirmed seat, we recommend using points to book an outright business class reward seat. Life is too short to leave your comfort to chance. + Can't I book myself? Yes you can, if you can find the right seats. Since, reward seats are constantly changing. Available seats can be booked by anyone anywhere 24/7. The more you look, the higher your chances. + Can't the airline help me book? When you call the airline, they can tell you if there are seats only at that time. Once you hang up, they'll be helping the next caller. You will need to call them again and again to get new options. Does the airline care if they find your seat...? With iFLYflat, our team is searching for your seats continuously to win your business. + When are the booking fees due? You are engaging us to find the right flights, fees are payable if the flights info we find for you are utilised for a booking (payable whether we book it for you, or you book it yourself). Your iFLYflat travel manager will take care of your entire booking. Ready To Book Your Seat? I have read the Concierge Guide, and understand the fees and process. When ready, click below to begin.